We don't do a lot of press releases anymore, but here's one that went out earlier this morning. Congrats to my team here at SnapStream! 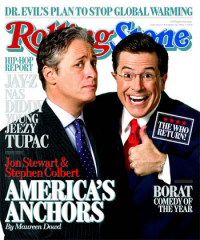 Houston, December 21, 2009 - SnapStream Media, Inc. announced today that Comedy Central’s hit TV shows "The Daily Show with Jon Stewart" and "The Colbert Report," have selected the company’s TV search solution for locating and packaging high-definition clips from television broadcasts. Launched in 2007, SnapStream Server is a turn-key television search appliance that enables organizations to record and store thousands of hours of television and then search inside those recordings by keywords and phrases. The SnapStream TV search solution to be deployed at the Daily Show and Colbert Report will provide for a completely high-definition (HD) workflow, allowing the show’s producers to centrally record and archive more than 30 channels of traditional HDTV; then subsequently search those recordings, create clips that can interact with Avid and Final Cut Pro video editing systems. Visit the http://www.snapstream.com/ website to learn more about SnapStream's affordable and effective TV search technology - our turn-key TV search appliances starting at $2,000. This entry was posted on Monday, December 21, 2009 at 12:49 PM. You can follow any responses to this entry through the RSS feed.